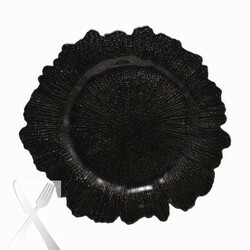 Ten Strawberry Street Black Reef Glass Charger Plate 13-1/4"
Home > Products > Ten Strawberry Street Black Reef Glass Charger Plate 13-1/4"
Set a luxurious and eye-catching table with the Ten Strawberry Street Black Reef Glass Charger Plate 13-1/4". The unique, textured reef design and sleek black finish make a brilliant combination that is perfect for weddings, celebratory occasions and formal affairs. Designed for use beneath dinnerware, this piece is a stylish option for enhancing table decor without breaking the bank. Made from high quality glass, this charger boasts a delicate look that belies its exceptional strength and outstanding durability. A versatile accessory, it also prevents spills and mess that might otherwise stain your tablecloth. This chic and sophisticated charger plate should be hand washed only.